Some jailbreak tweaks are worth the hassle of jailbreaking your iPhone all on their own, and Delicious Inc’s BiteSMS is one tweak that definitely falls into that category. BiteSMS has been around for a long time, and it just keeps getting better and better. Today the folks behind BiteSMS handed out some very good news after one of its forum moderators informed a fan that the development team behind the tweak is working on an iOS 8 update for it, and that it should be available to download from Cydia within a couple of weeks. It appears as though the team behind BiteSMS were holding off their own update until Pangu8 was updated with support for Cydia right off the bat. The update will be a free one for existing users, with a $7.99 cost associated for those new to the tweak and don’t want to see any ads. 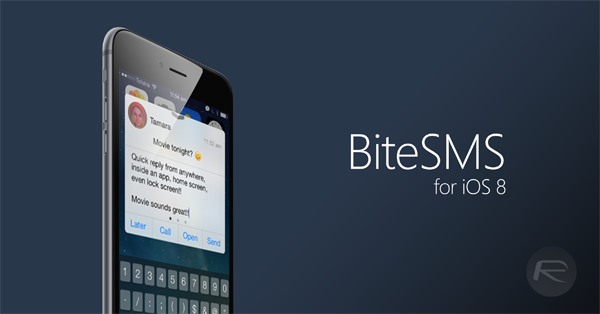 BiteSMS has long been the go-to tweak for people wanting to extend the abilities of Apple’s built-in Messages app or, more accurately, replace it entirely. Lock screen replies and messaging from anywhere was available long before iOS officially got such features in iOS 8, and all thanks to BiteSMS. The new update will be an interesting one, and users will be looking forward to seeing what’s new this time around. We can’t wait to see what Delicious Inc. comes up with. And when the update is available for everyone to download, we’ll surely keep you posted, so keep an eye out! I like bitesms, but I like ios 8s quick reply better. The only reason to get it anymore is for delayed text and quick compose (at least for me). I moved on to Auki just cause i gate the bitesms UI. It looks like a pop up bubble from ios 5. Dated and doesn’t match the look of ios anymore. 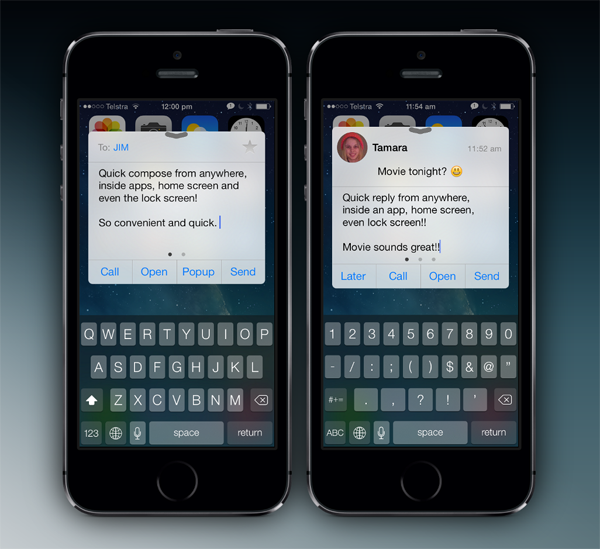 They will likely update BitesSMS to integrate with the iOS 8 quick reply while adding more features, making it even better as they usually do. Except when you receive a new text messages as you are already typing a response and you have lost everything you just typed with the native Apple quick reply button…. Yeah just keep using that frustrating crappy native messenger! It is still the only app that lets you reply from a locked screen. That is why it is my messaging app. Nothing worse than having to unlock your phone for a text message and to reply to it. most used apps was still compatible!! I updated without thinking and I regretted it, is there any recent update on the progress on BiteSMS for iOS8? cant believe no bite sms for ios8 yet. how long has it been? 3-4 months now? beta was out way before the iphone 6,+ dropped. cmon now. Not true! It won’t be out for at least a few months, the main programmer of BiteSms resigned recently and they stated in an email to myself (paid customer of the tweak) it won’t be out for months!!! iOS 8 allows you to respond from the lock screen natively. It’s not as nice as BiteSMS though. Any user who loved BiteSMS on 7 and is now on 8 would agree with me. The stock iOS 8 version just is too limited. It’s not enough. Definitely wouldn’t have upgraded had I known bitesms wasn’t ready. I used to love BiteSMS, is there any other alternative out there?